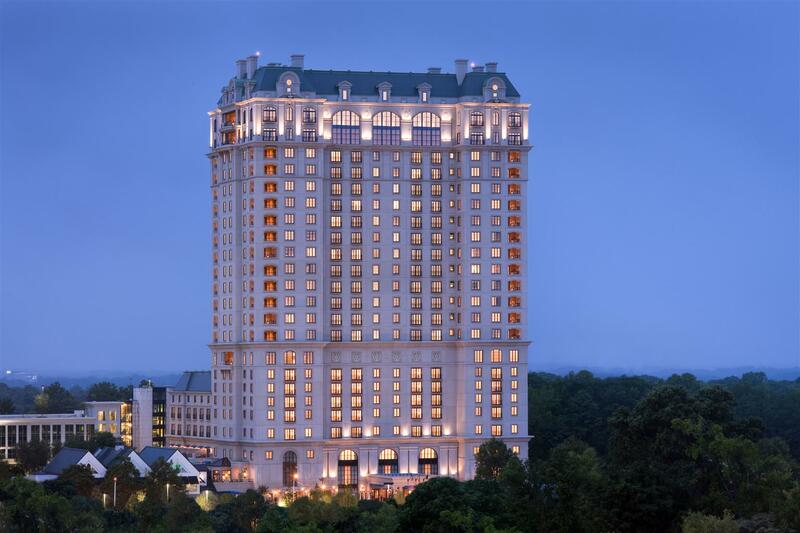 Located in the exquisite enclave of Buckhead just a few miles from downtown Atlanta, The St. Regis Atlanta stands out as an impeccably groomed "in-town" resort with a gracious, residential feel. Expect unsurpassed pampering in a grand location. Escape to the sumptuous Rem de Spa for sheer rejuvenation or linger around the 40,000 square-foot Pool Piazza-an inviting oasis where guests may relax in the jacuzzi, enjoy the outdoor fireplace and cascading waterfall or unwind at the poolside bar. Experience the allure of plush custom furnishings and original art in 151 spacious guest rooms, including 31 suites. Every suite experience is enhanced with St. Regis Butler Service, available any time, day or night. The address is the experience at The St. Regis Atlanta. Buckhead's charming streets comprise Atlanta's inner circle of unrivaled shopping and dining. Nearby, in the elegant heart of Buckhead, oak trees shade quiet streets lined with stately Georgian, Tudor, Italianate and Greek Revival mansions. The pedestrian-friendly avenues invite leisurely strolls. Guests may also be captivated by masterpieces at the High Museum of Art or a tour through the lush grounds of the Atlanta Botanical Garden. Discover the King Center for an intimate look at an American visionary, visit the Atlanta History Center, embark on a signature CNN Headquarters tour, or enjoy an outing to Stone Mountain. Take in a performance of the Atlanta Symphony Orchestra, the acclaimed Atlanta Ballet, or jazz in a lively nightclub. All are easily accessible from the hotel and of course, St. Regis Butlers are pleased to arrange tickets and transportation or to recommend and plan an entire day or evening excursion. General Shopping hours: Lenox Square: 10:00am 9:00pm Monday-Saturday; 12:00pm 6:00pm Sunday. Phipps Plaza: 10:00 am 9:00pm Monday-Saturday; 12:00pm 5:30pm Sunday. Serving breakfast, lunch, dinner, and afternoon tea, Astor Court represents a contemporary expression of the hotel s legendary heritage, including a dedication to discreet, anticipatory service and to the elegance of design. The St. Regis Wine Room offers personalized tastings around a mahogany marble-topped sommelier counter. Guests may enjoy wine flights and tasting menus at their leisure. The room is also available for private functions. Linger at the Poolside Caf and Bar and take in the relaxed ambiance in a casual dining atmosphere. The diverse menu highlights classics and Southern specialties. Guests may enjoy dining on the terrace or at the bar. This chef-driven restaurant celebrates the best of seasonal American cuisine with a focus on fresh ingredients from local farms and intelligently blends in European influences. A private dining space can accommodate up to 12 guests.